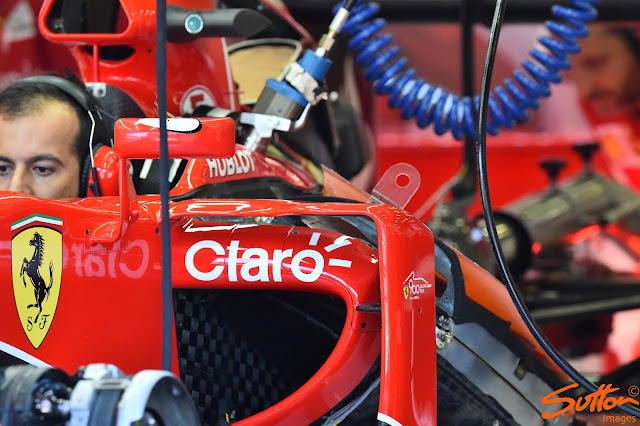 A selection of the best technical images from the Belgian GP courtesy of Sutton Images that will be updated throughout the weekend. 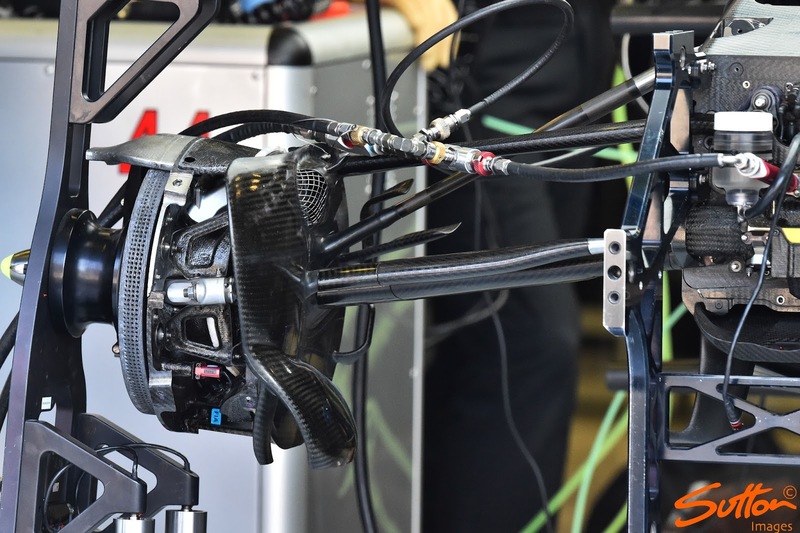 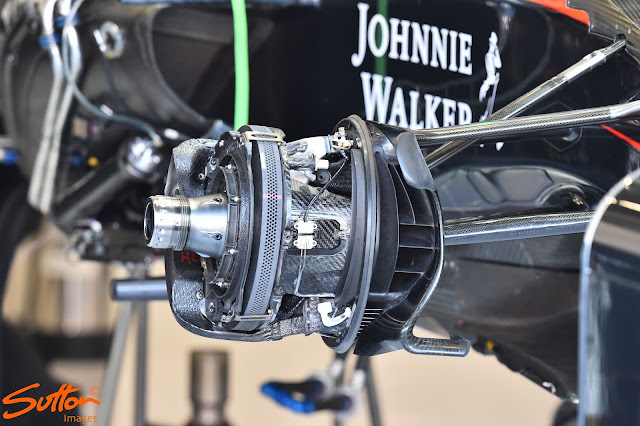 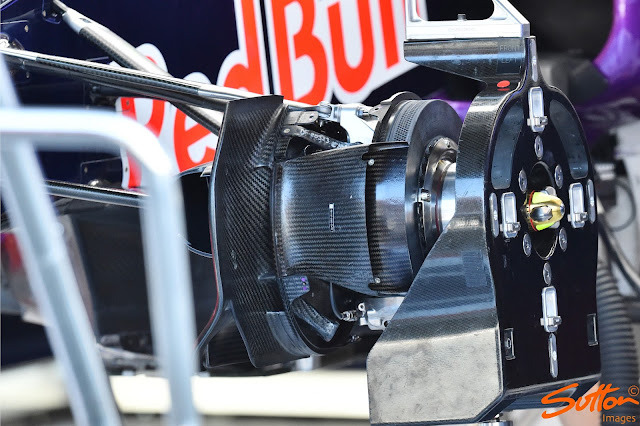 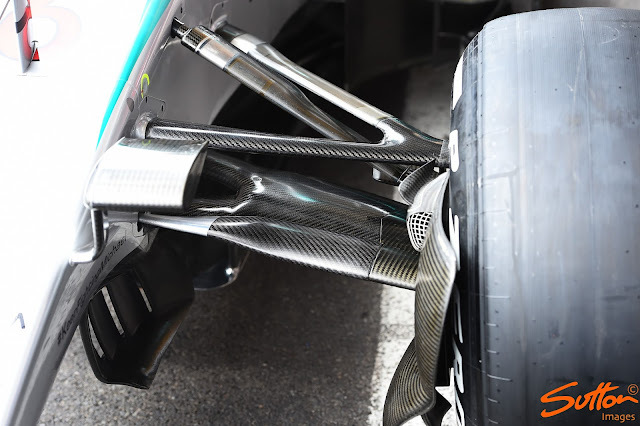 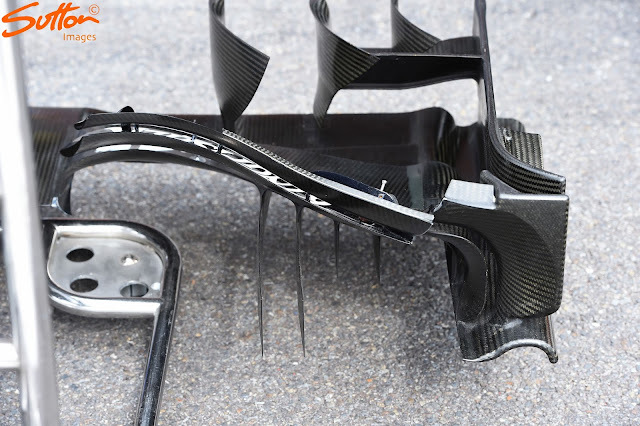 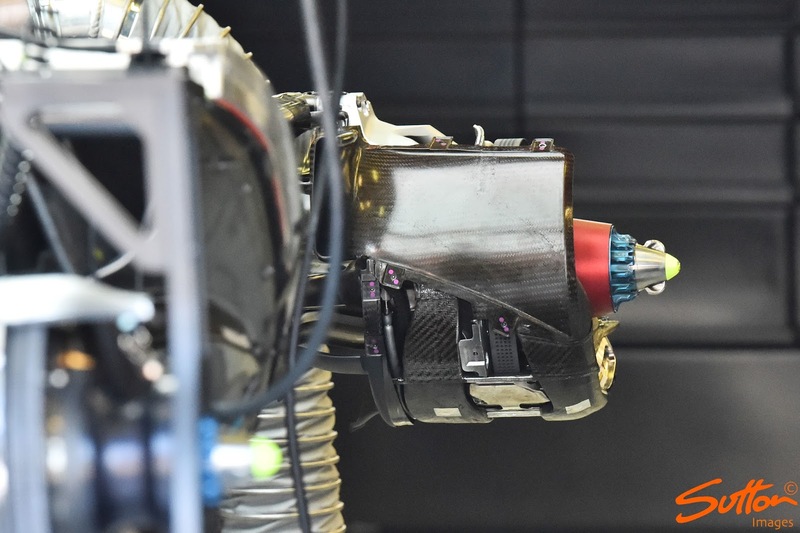 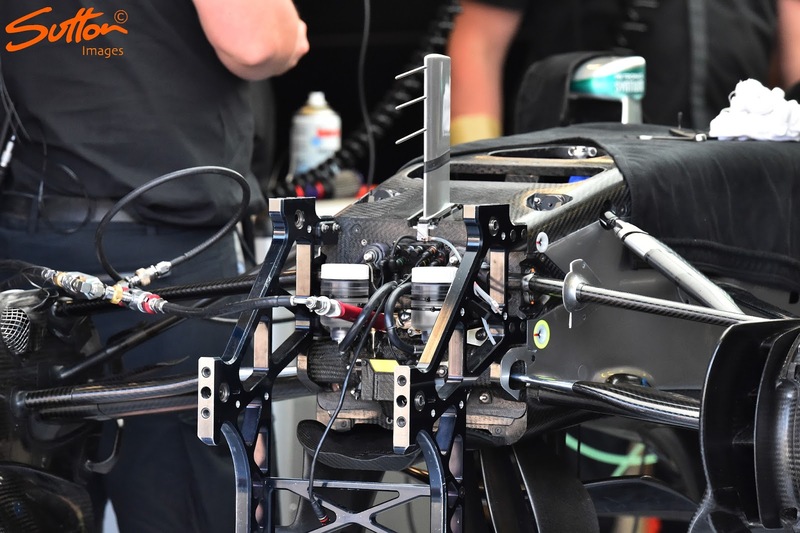 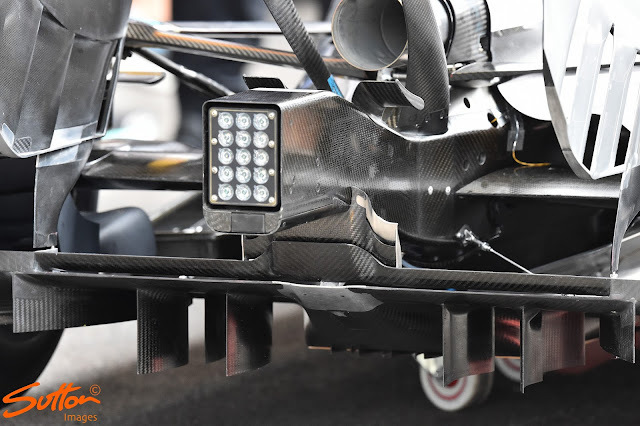 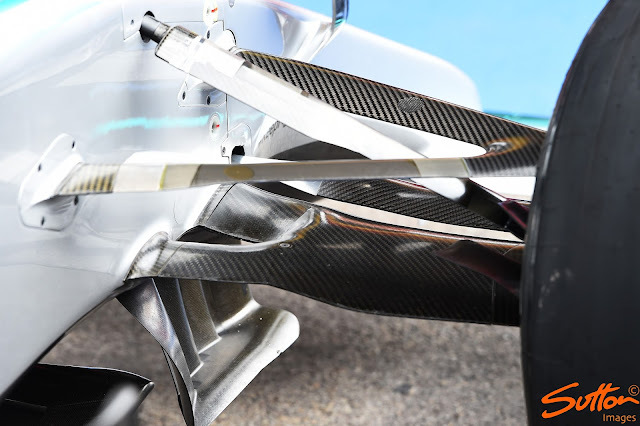 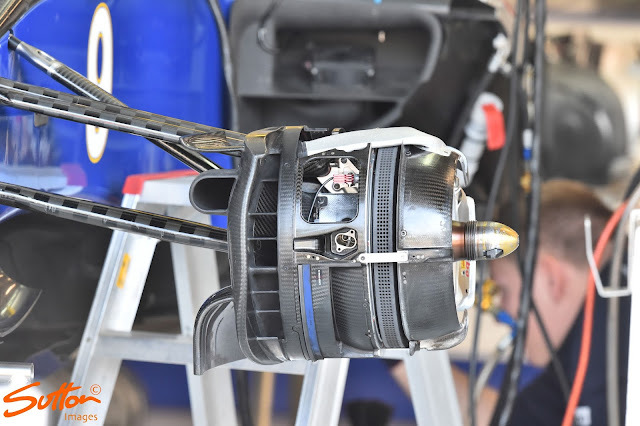 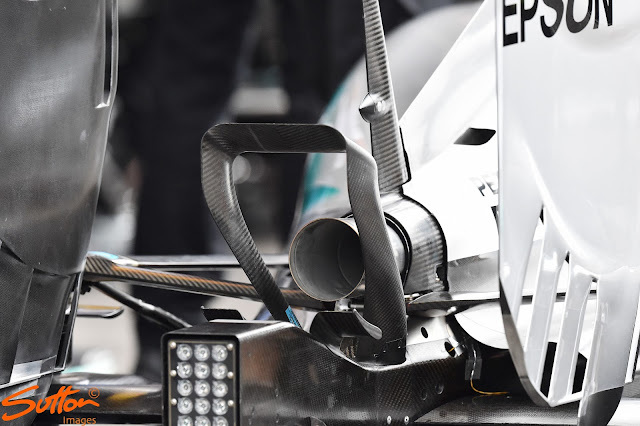 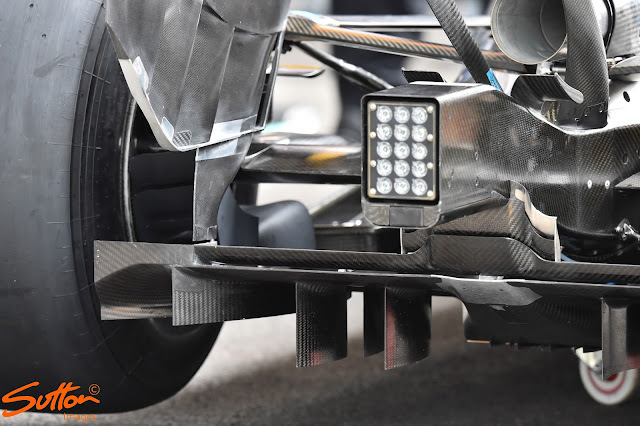 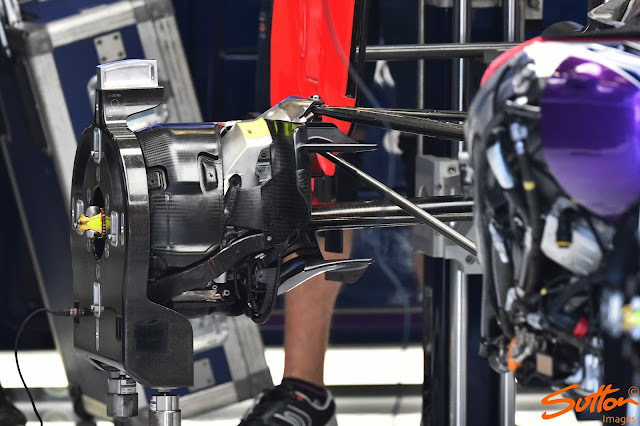 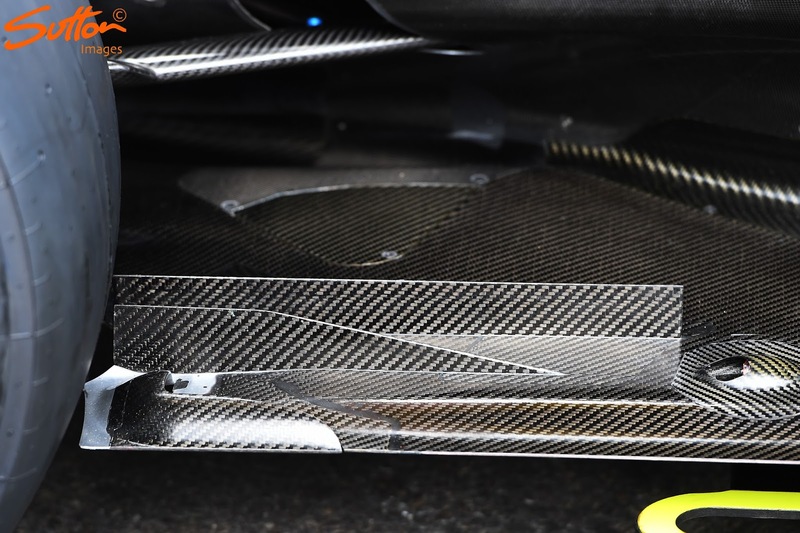 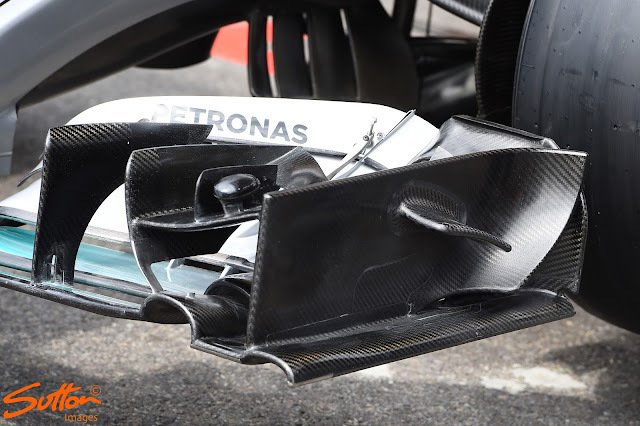 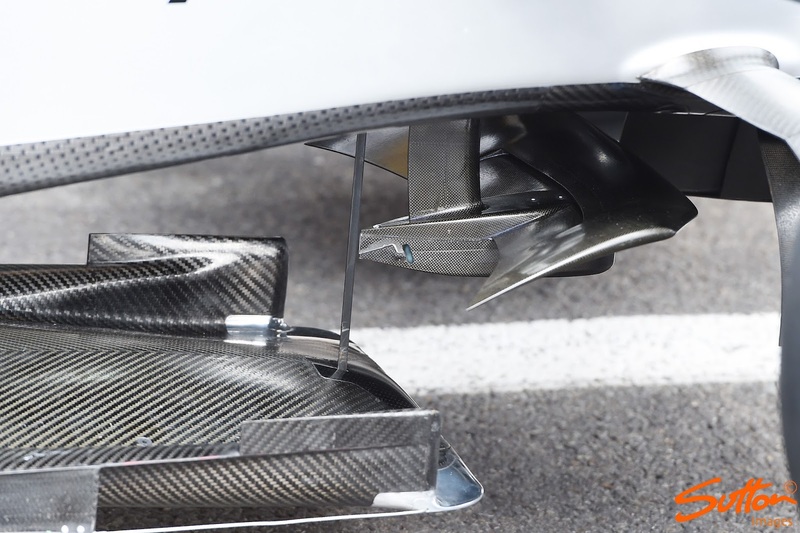 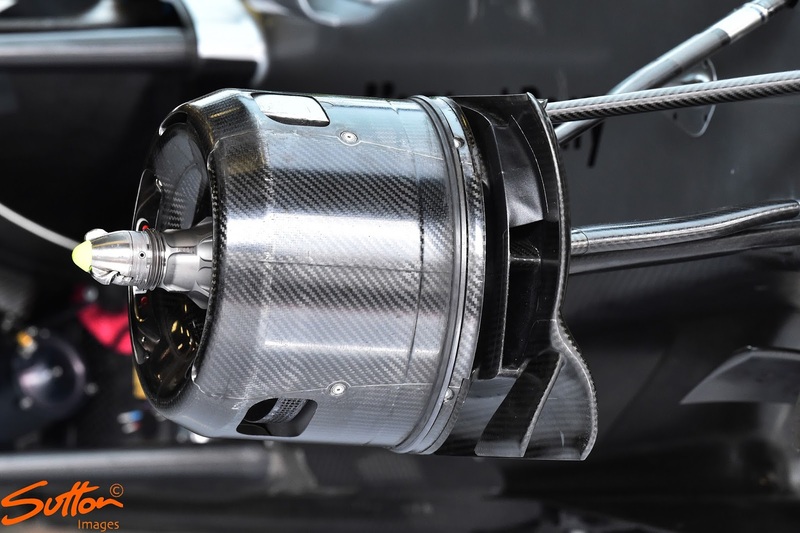 Mercedes W06 front brake duct detail, note the upper crossover pipe in place which dispenses airflow out of the wheel face taken in by the scoop. 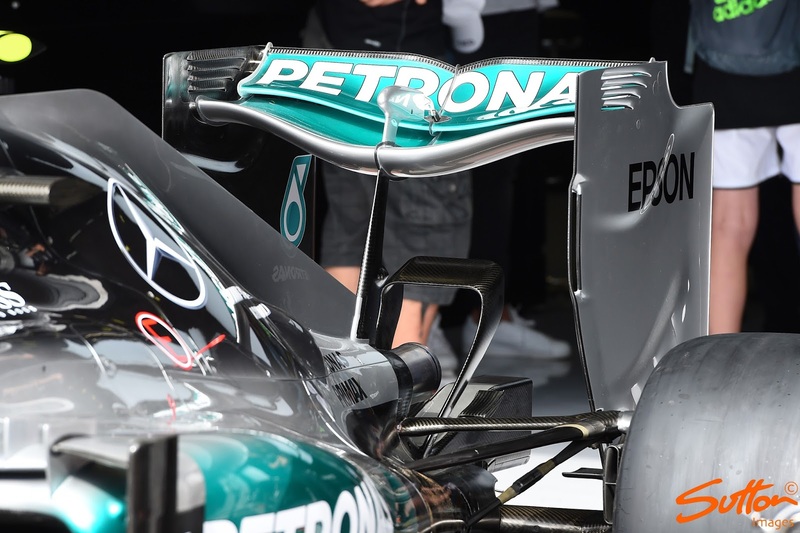 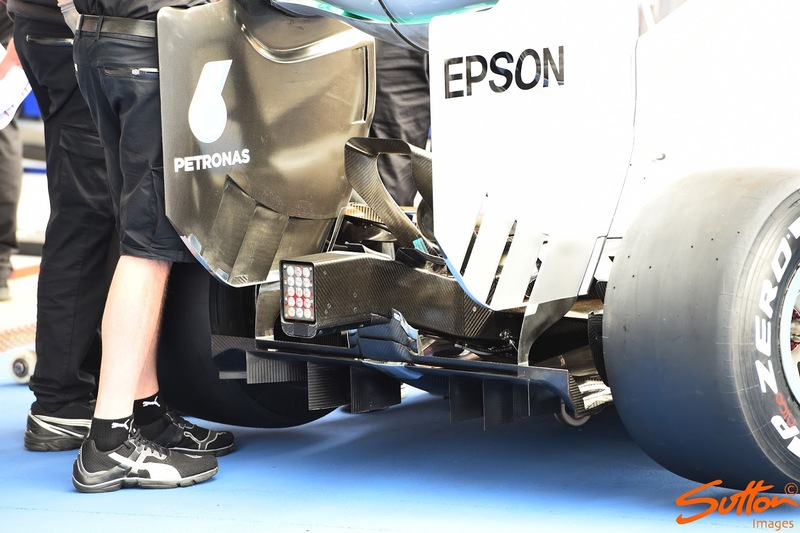 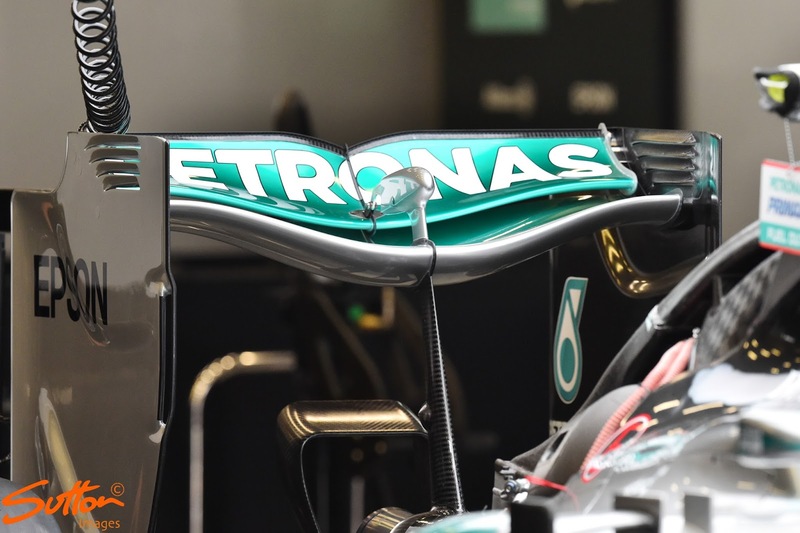 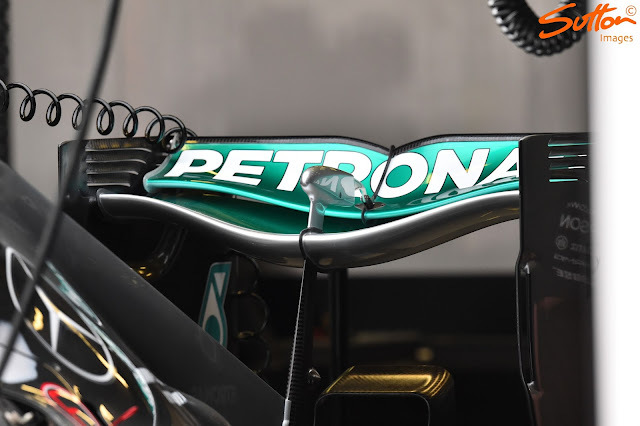 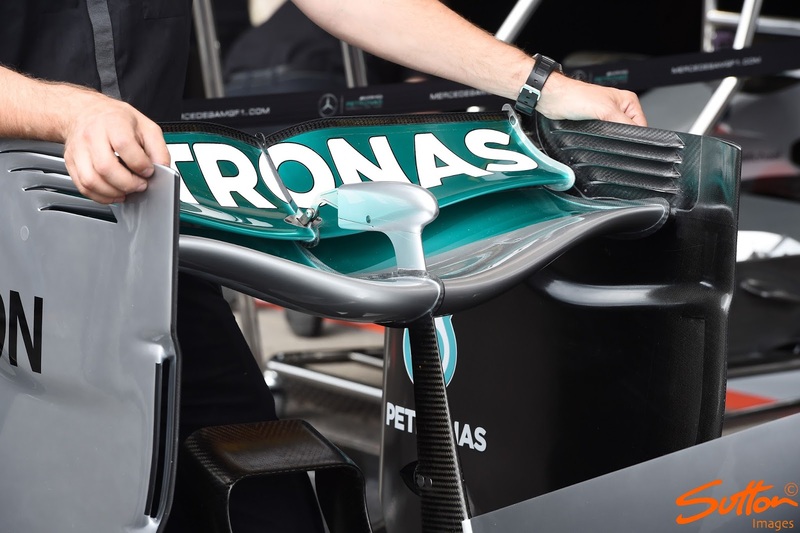 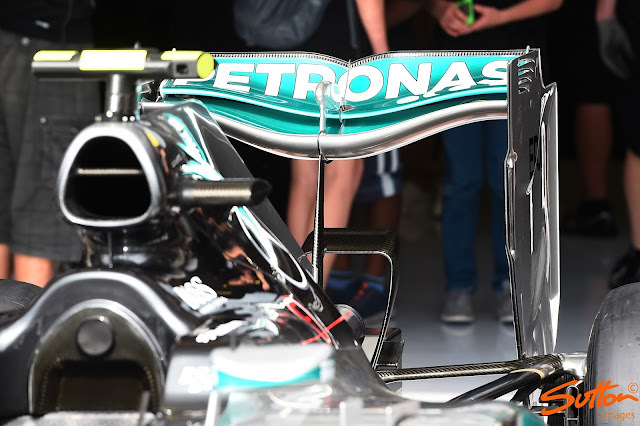 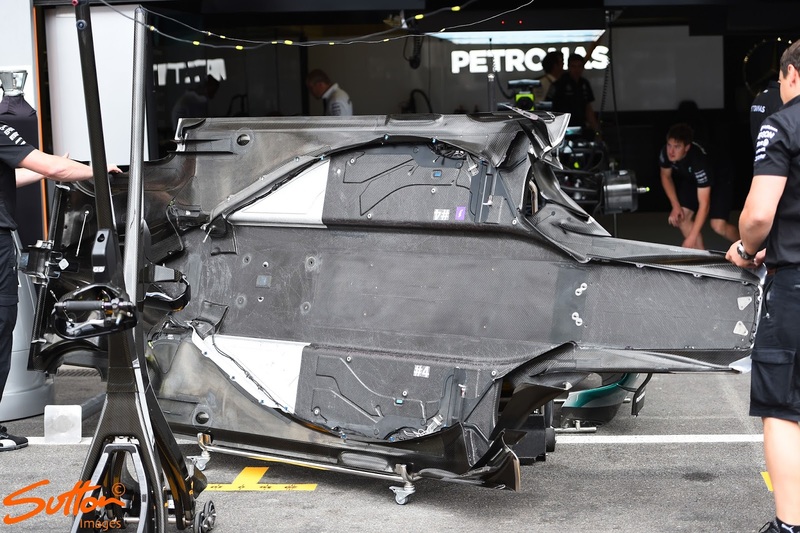 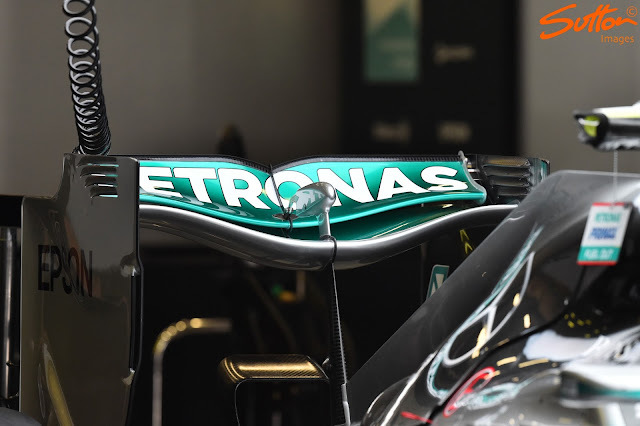 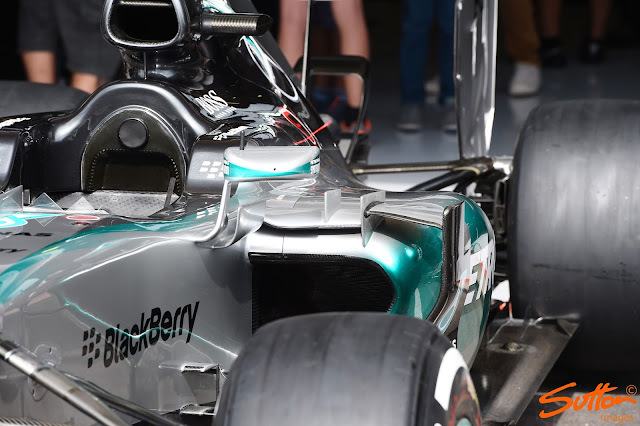 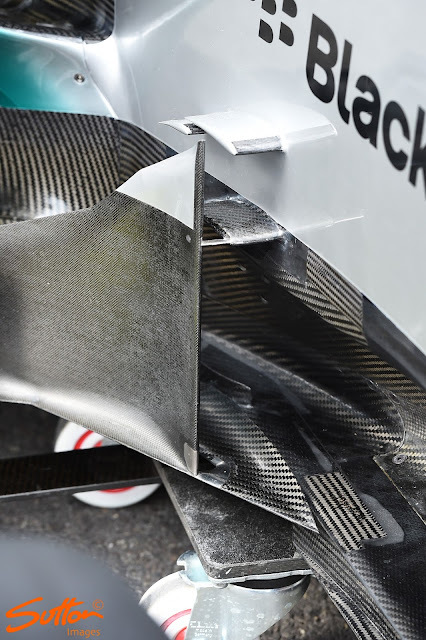 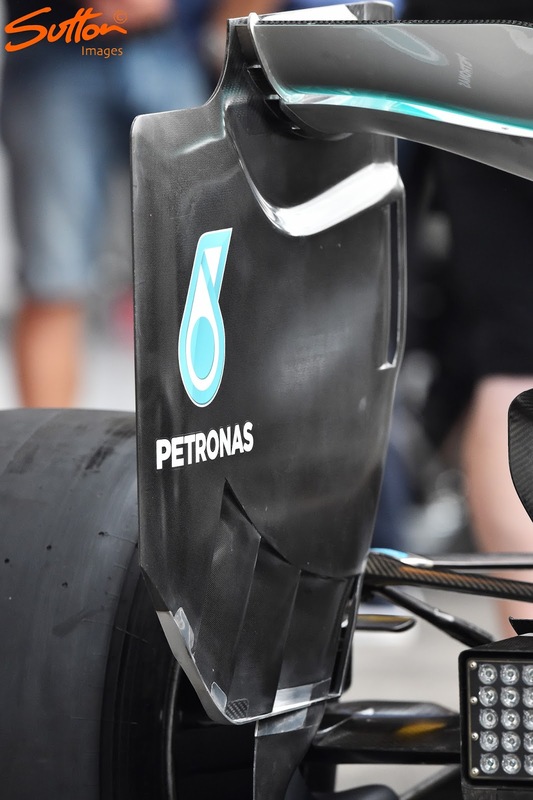 Mercedes W06 'spoon' style rear wing. 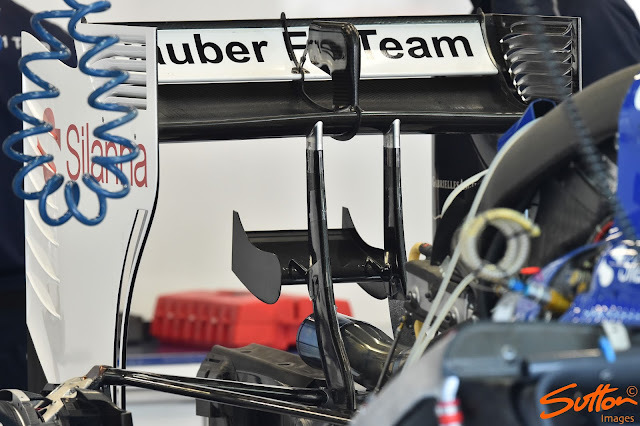 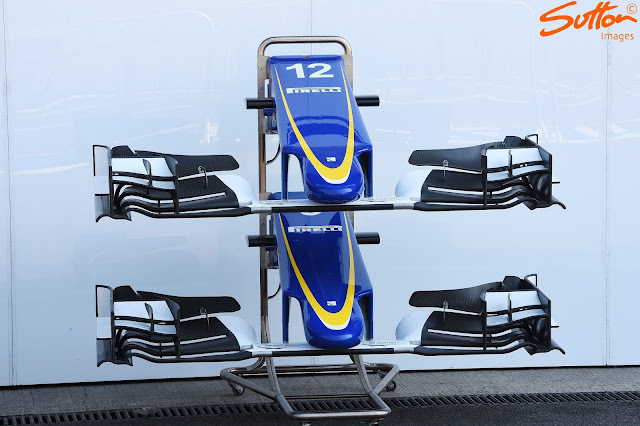 Last seen used by Sauber in 2013 this style of rear wing tries to leverage as much downforce as possible, whilst reducing drag through the reduction of tip vortices. 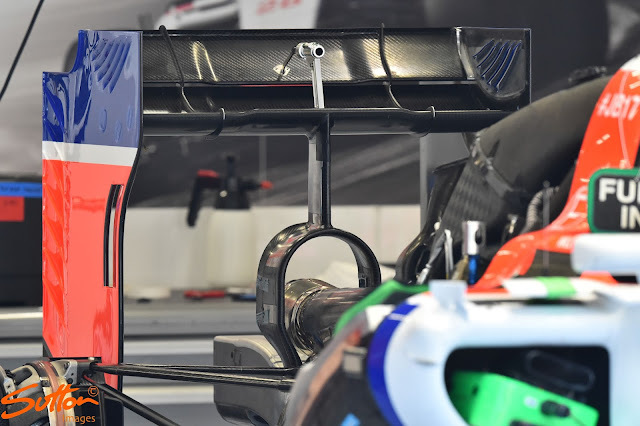 You'll note the team have also installed the less complex Y100 winglet (Monkey Seat) we first saw in Hungary (but not raced) which helps with flow attachment along the centreline. 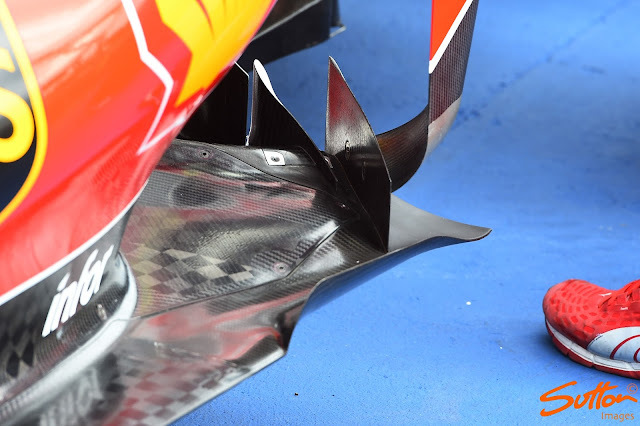 The leading edge slots have also been extruded inwards to allow more airflow inboard, once again changing how the vortex is created at the tip juncture. 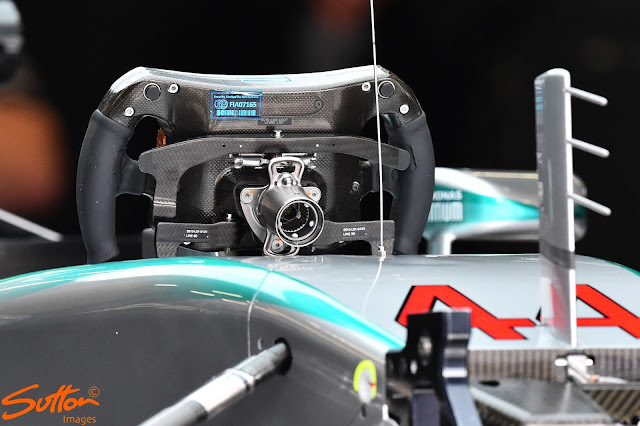 Mercedes W06 serrated windscreen, most likely Nico Rosberg's as he runs this spec continuously, however, Lewis has dabbled with it. the bulls have vastly increased in just over a month!!!!! 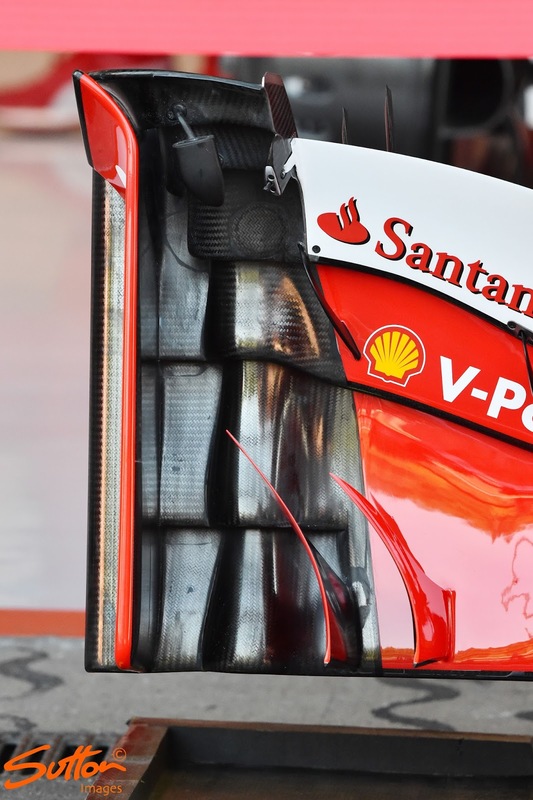 ferrari and williams look stagnant!!! 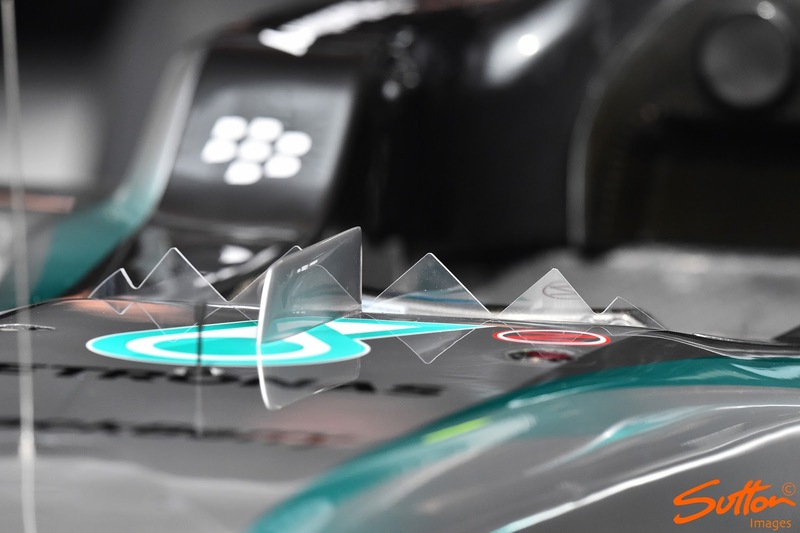 Does anyone know what possible advantage there is to the Mercedes serrated windscreen? 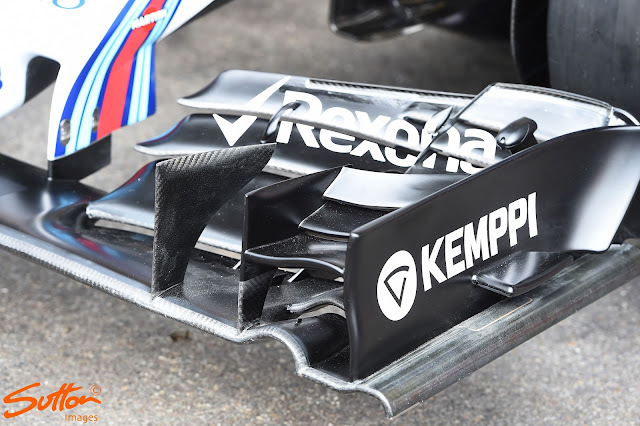 Those are vortex generators(VG). 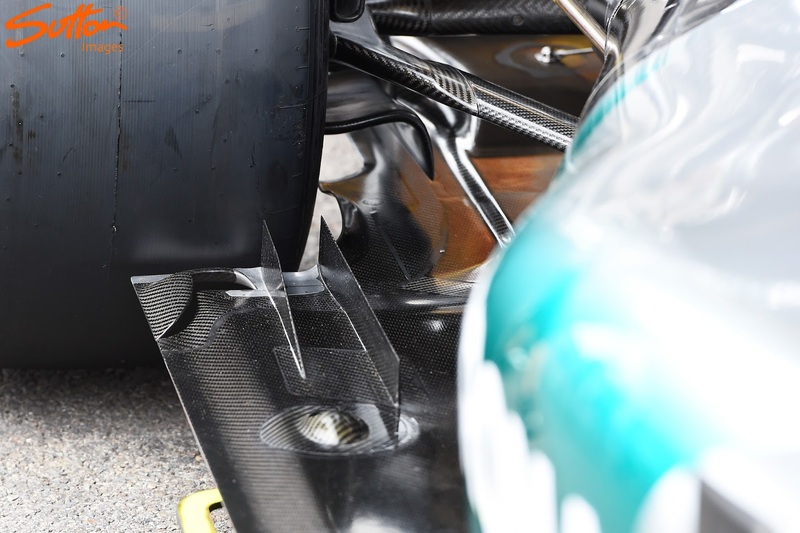 A VG scrambles the airflow into a vortex like you see in your sink drain for example. 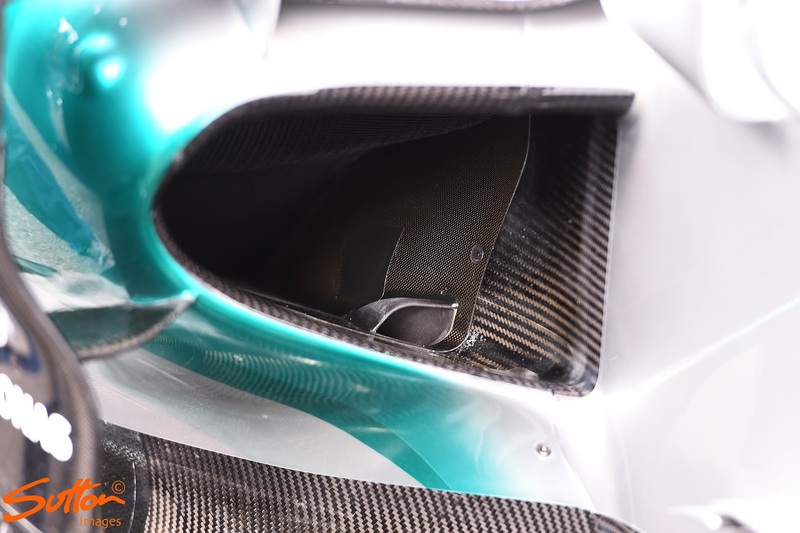 The advantage is that the airflow actually follows contours better when in a vortex. The bad thing is that vortexes produce drag. 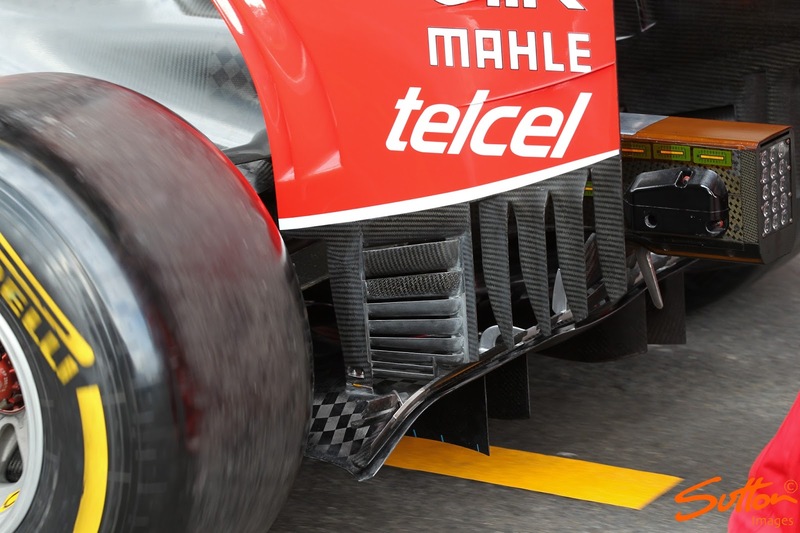 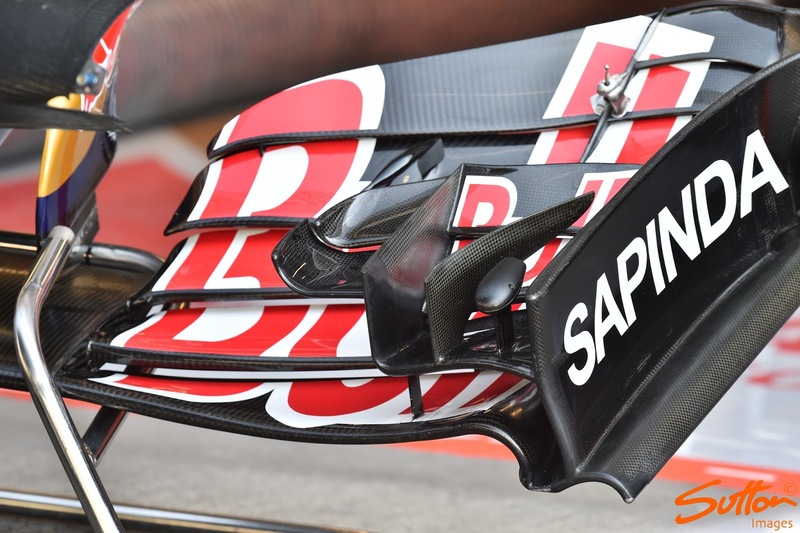 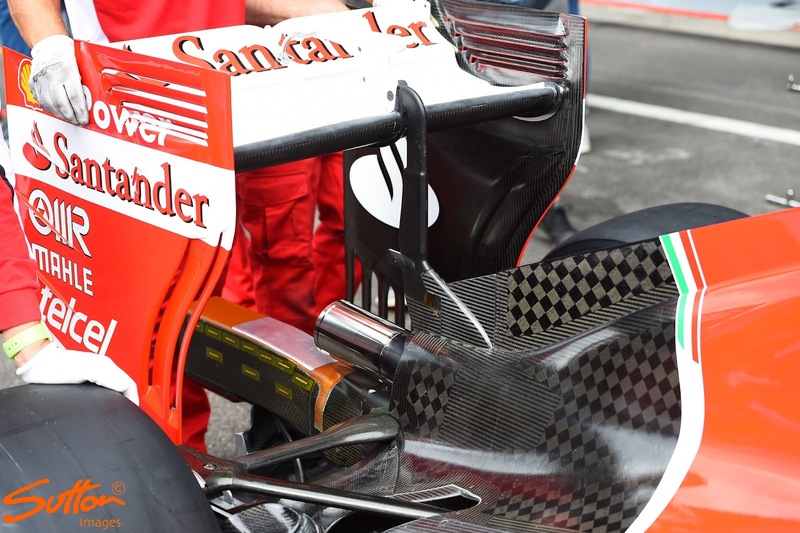 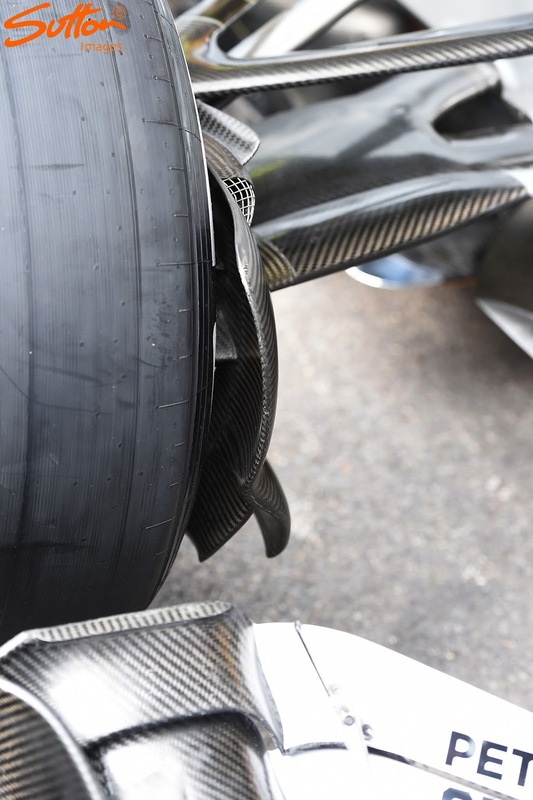 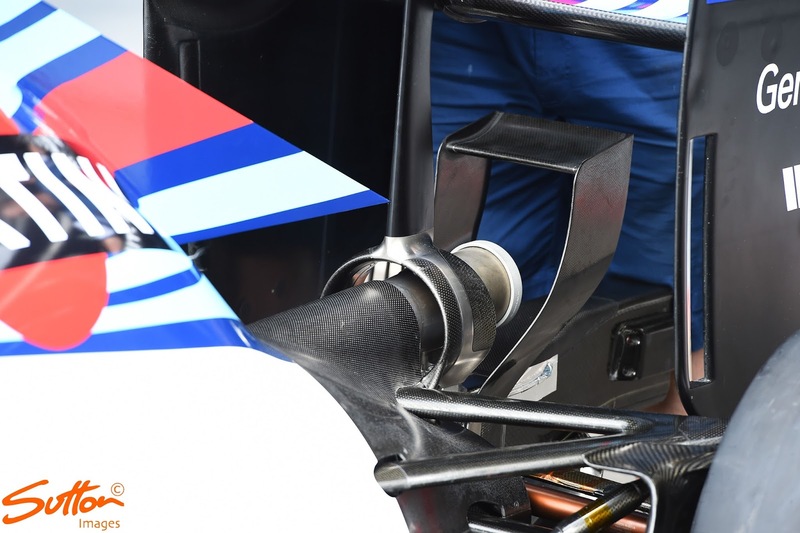 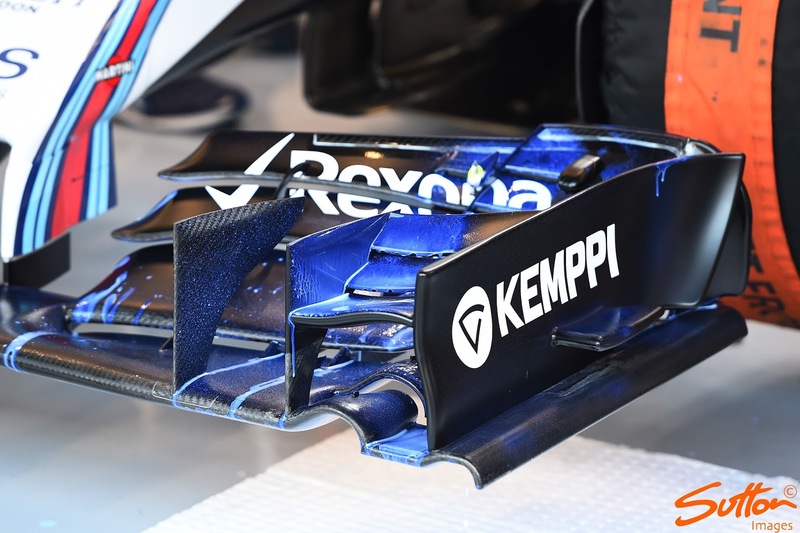 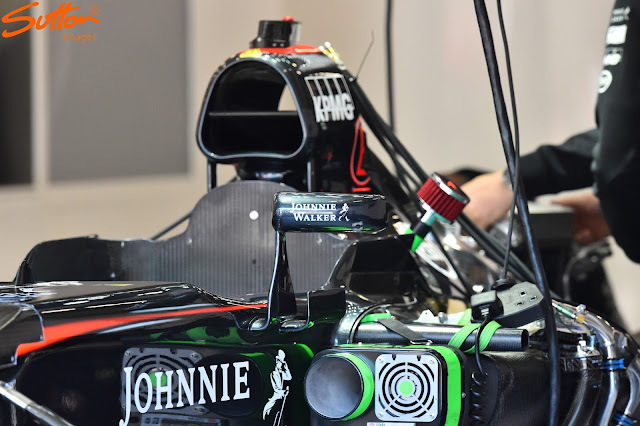 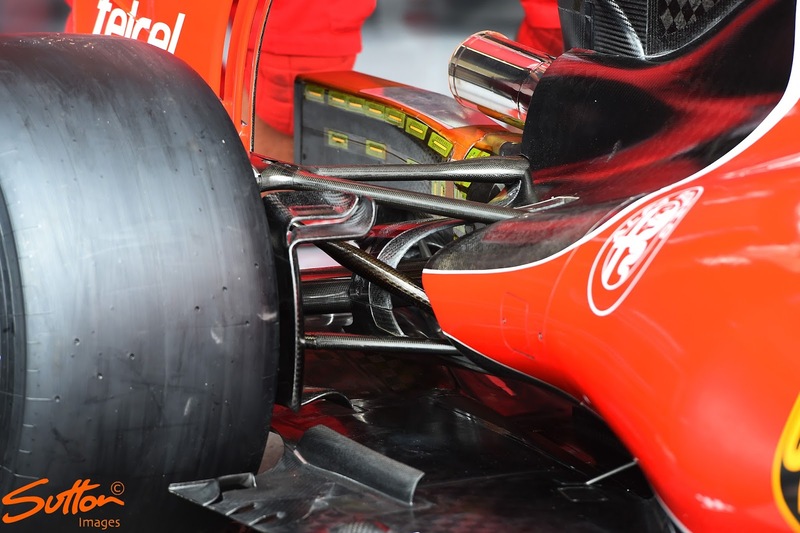 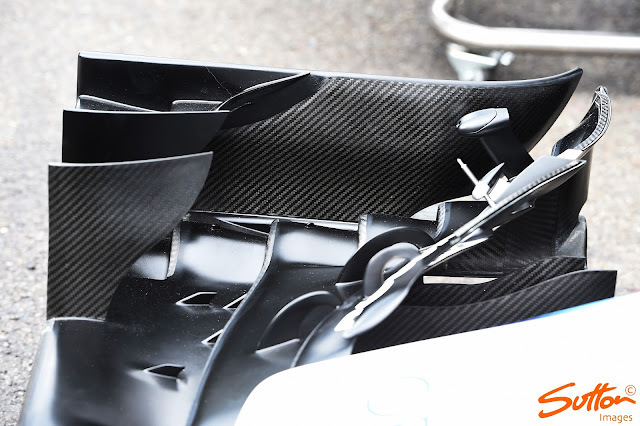 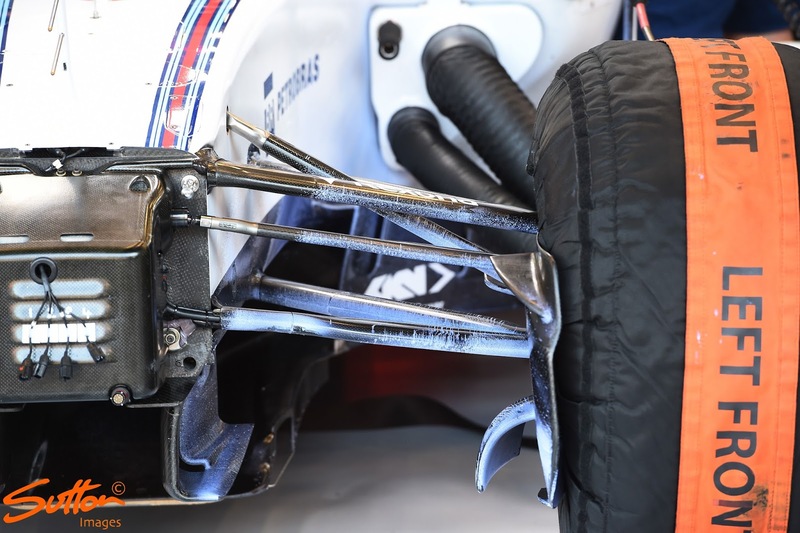 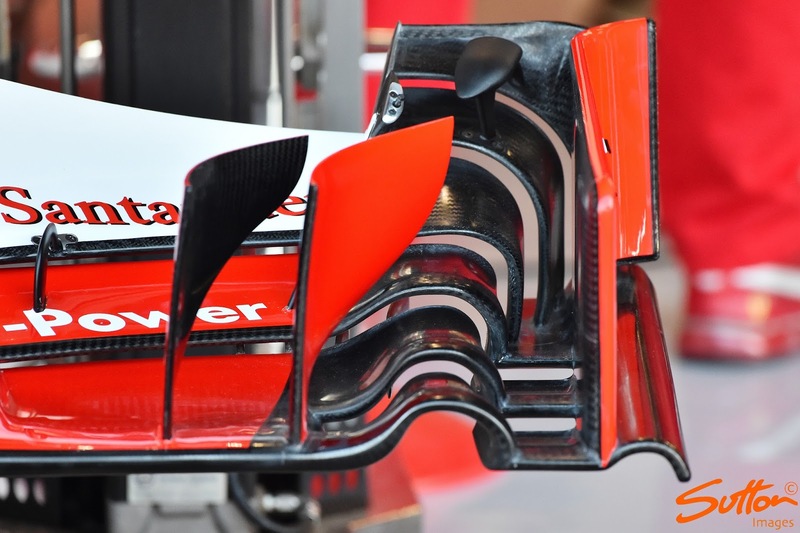 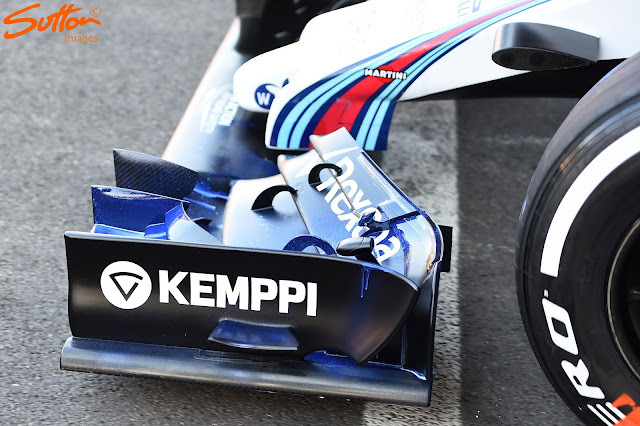 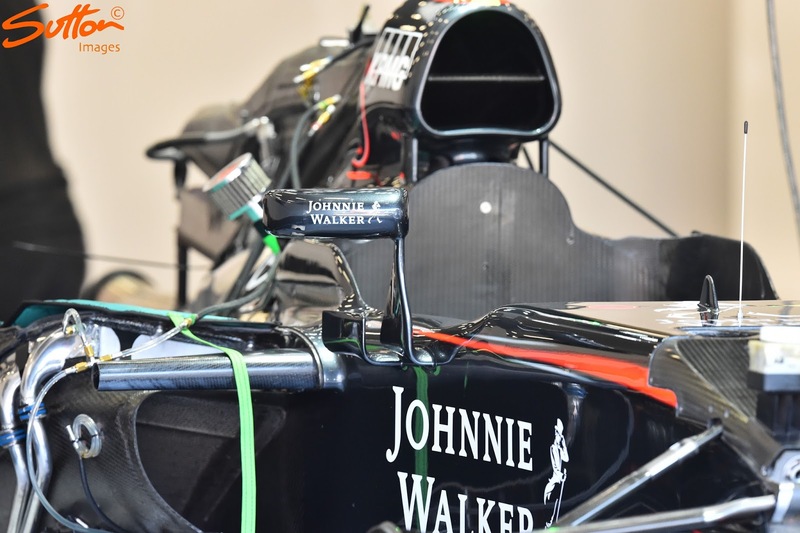 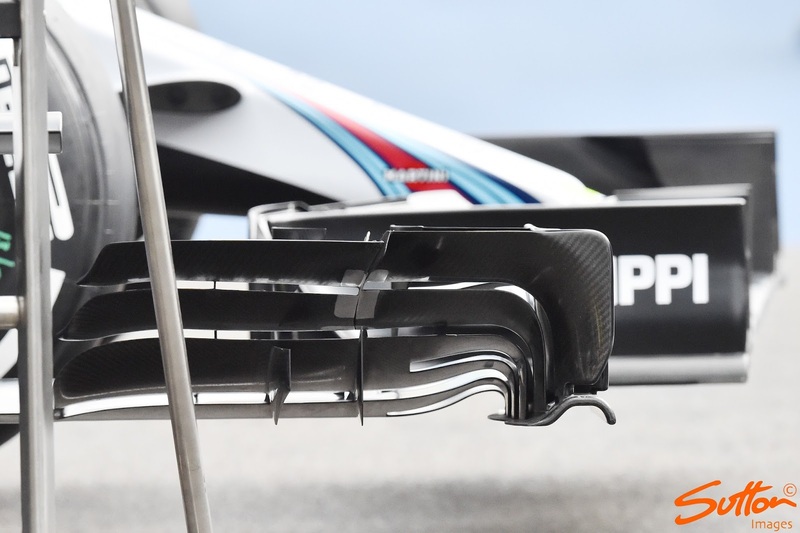 These could actually aid the airflow back to the revised rear wing for example. That's pretty interesting. 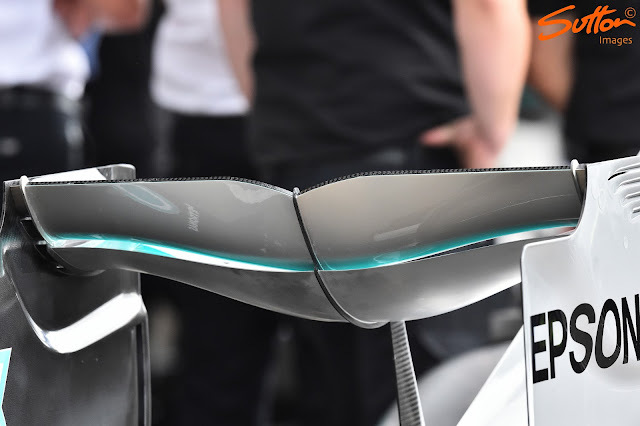 I really didn't think that it could effect farther back.It makes sense though. 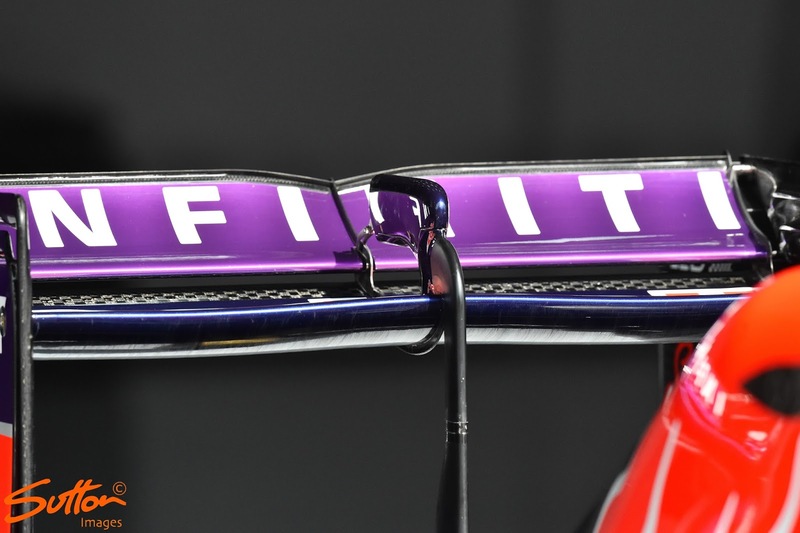 I'll side with you .. there is no way WE could know that. 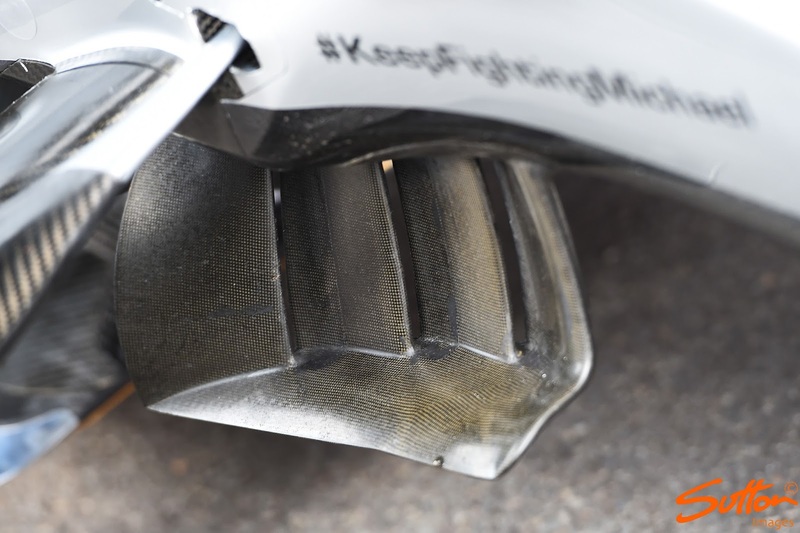 Understand though that airflow always begins at the beginning, as in the nose of the car. 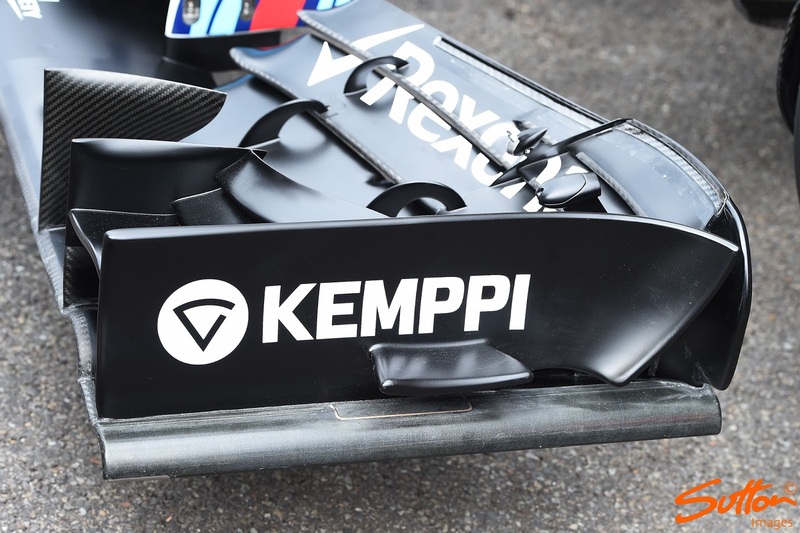 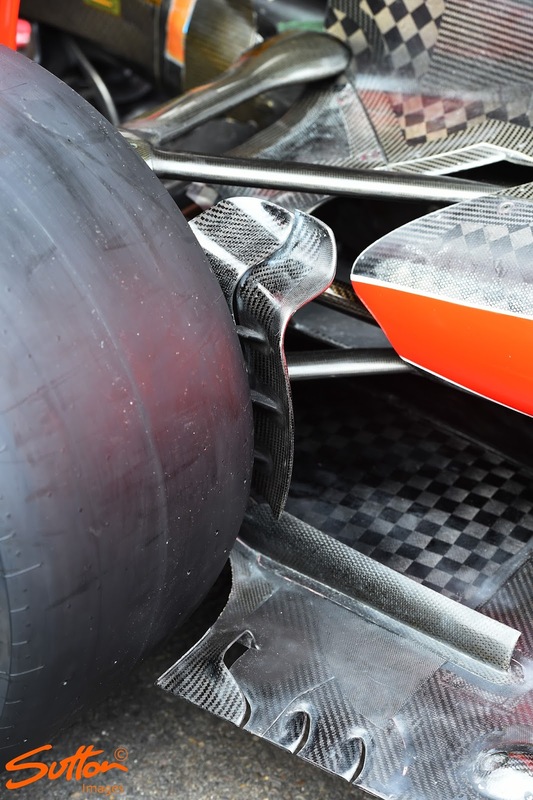 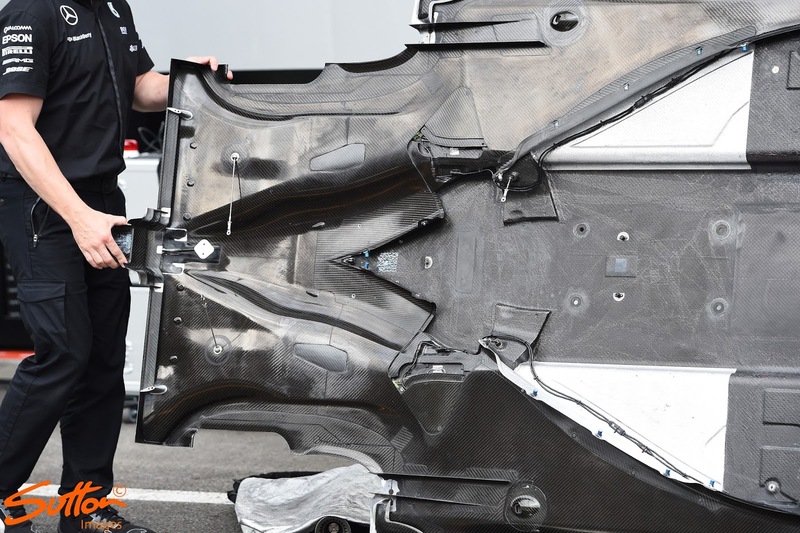 The biggest reason for front wing/tea tray/ barge board development is to harness airflow further downstream, as in all the way to the back of the car, and beyond even. 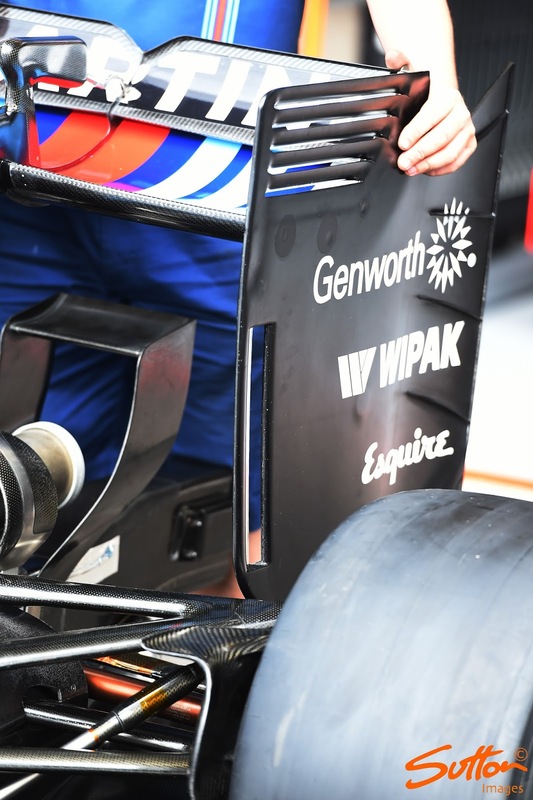 Little things, as Vgs are for example can have a great impact in what they PREVENT from happening, as in flow separation (a bad thing) in yaw for instance. 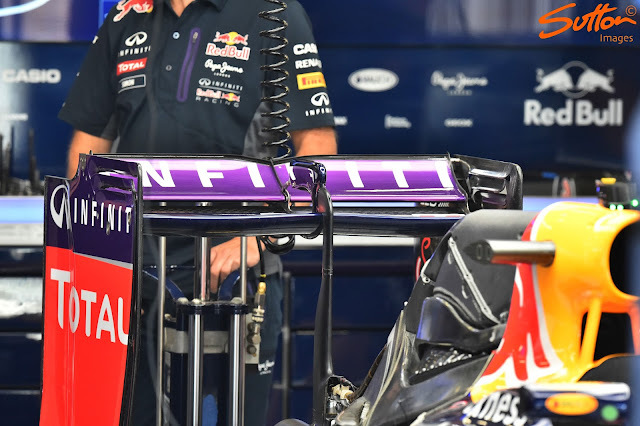 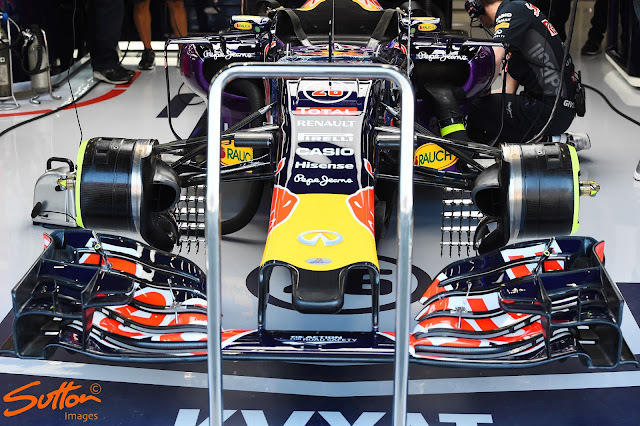 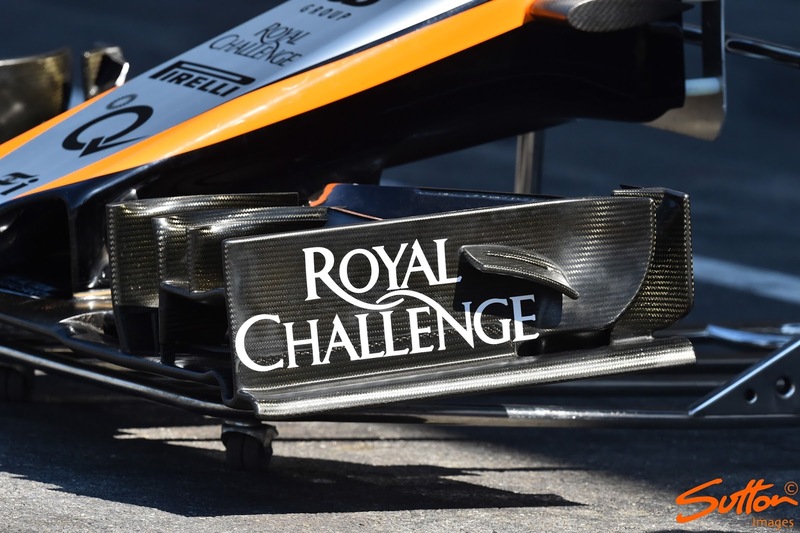 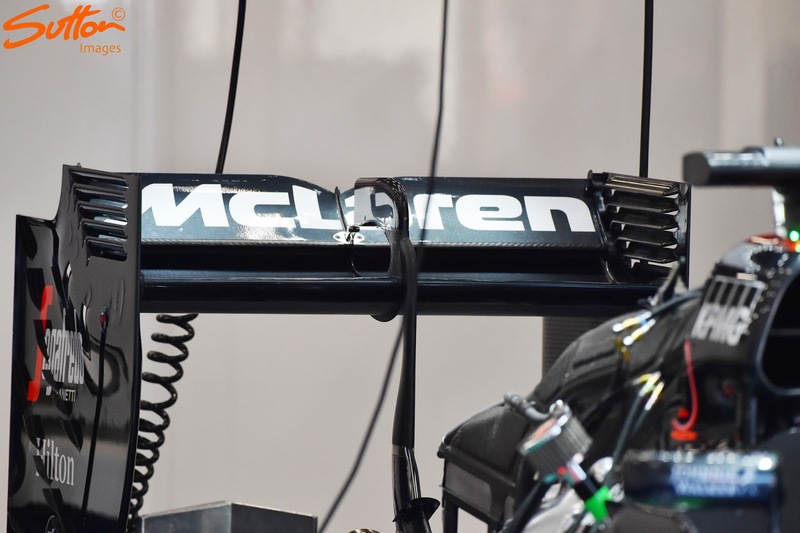 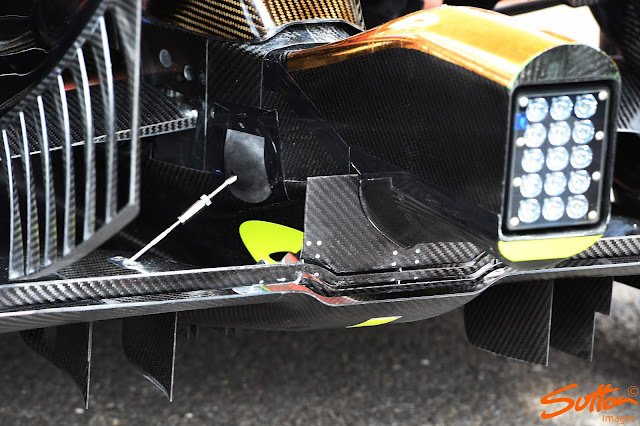 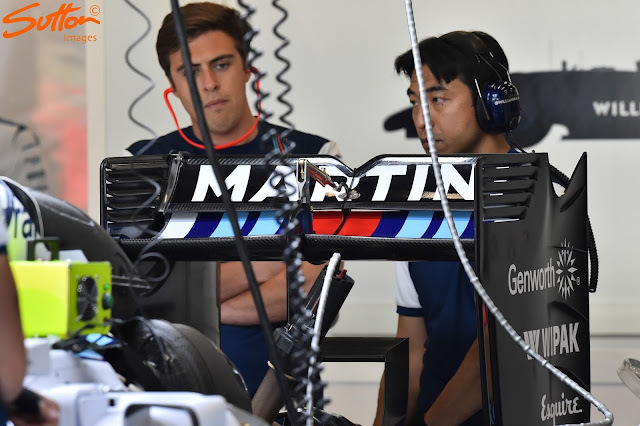 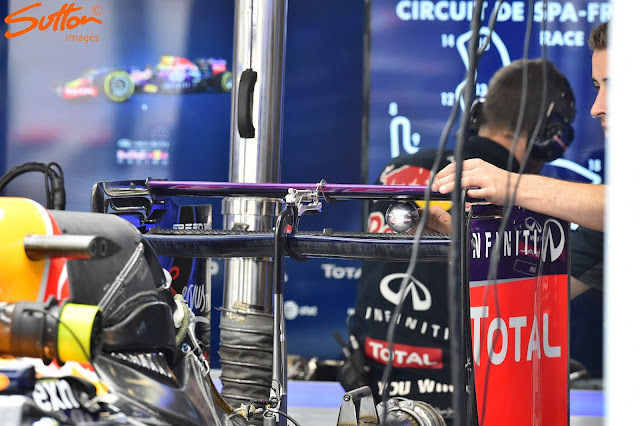 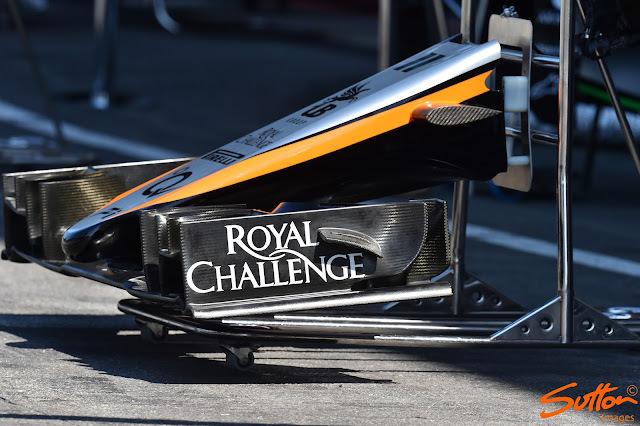 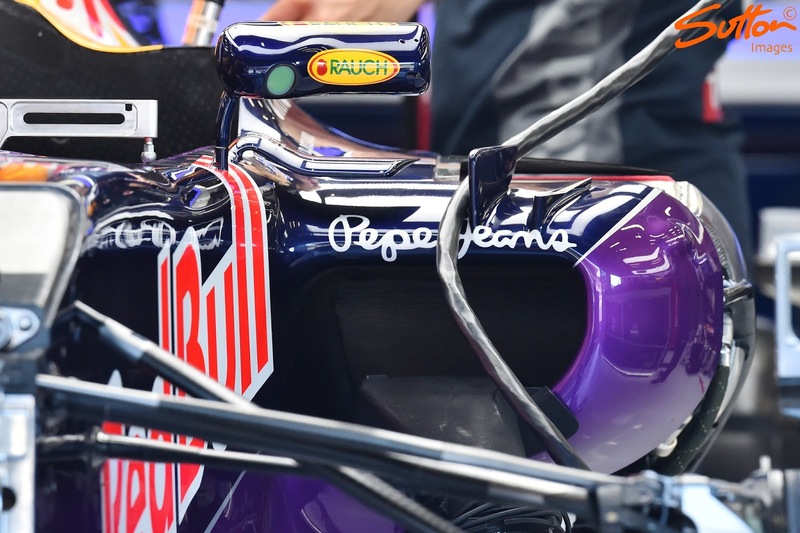 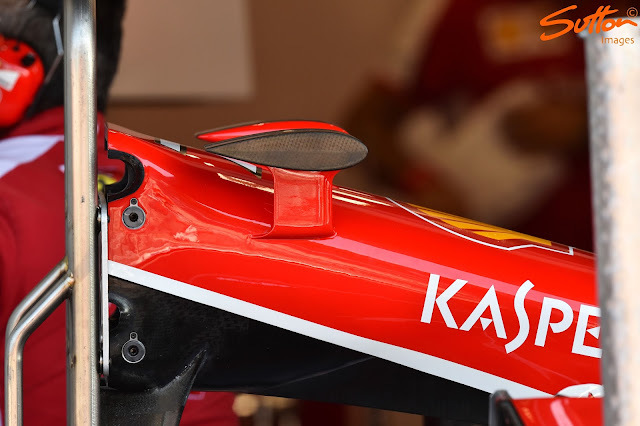 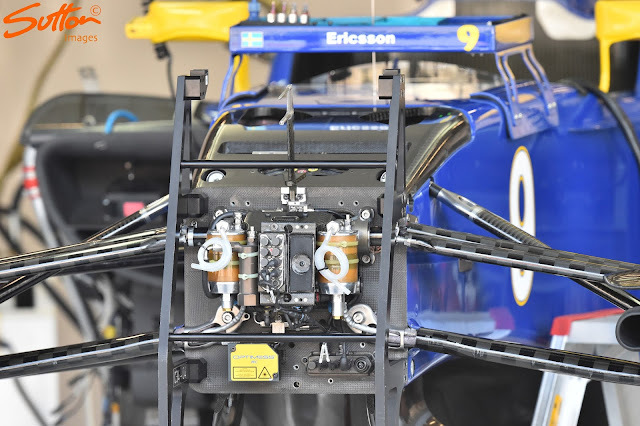 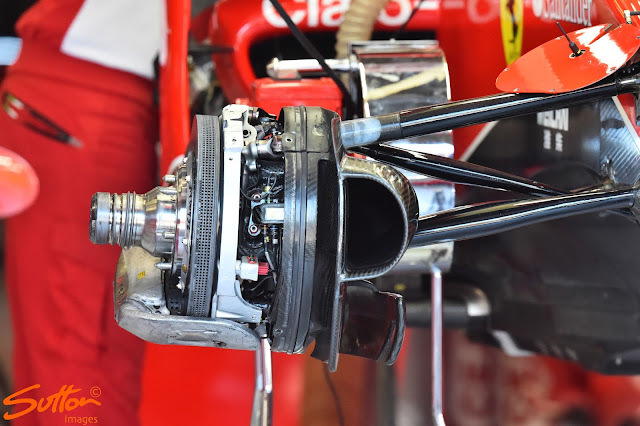 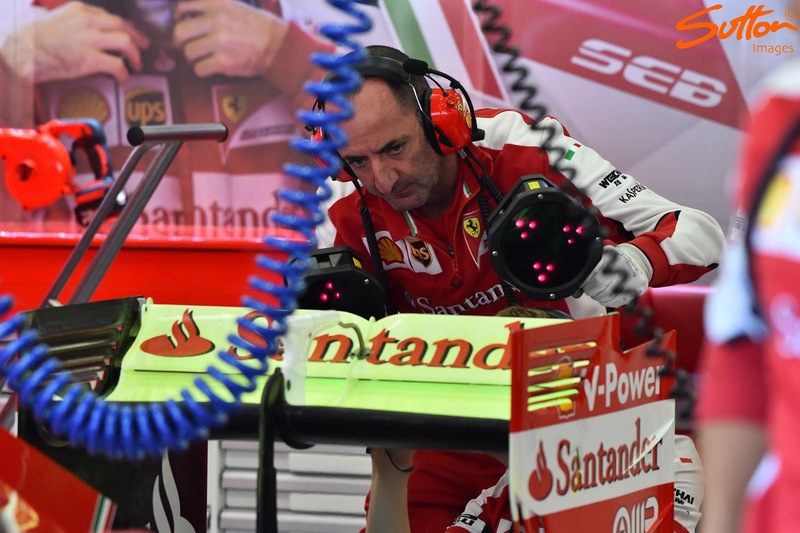 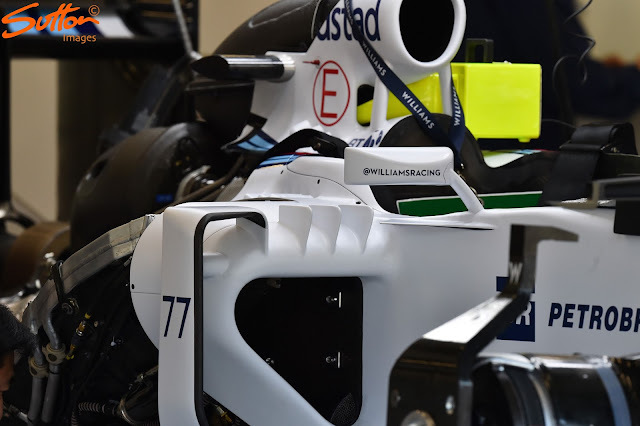 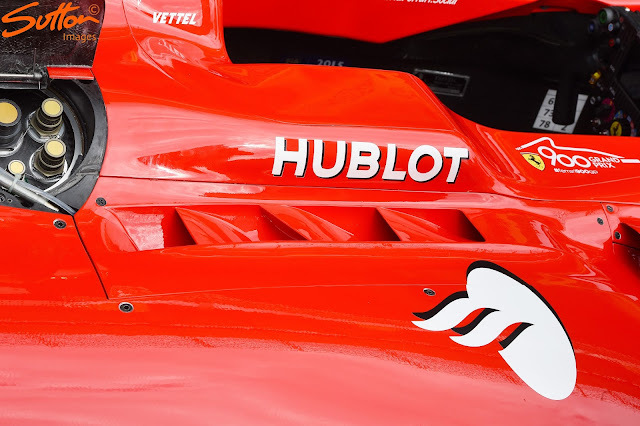 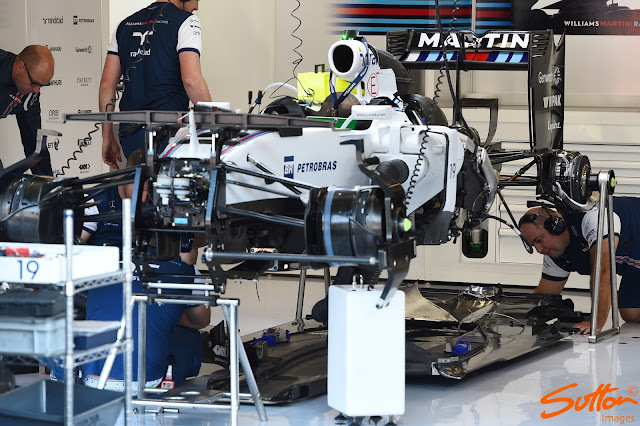 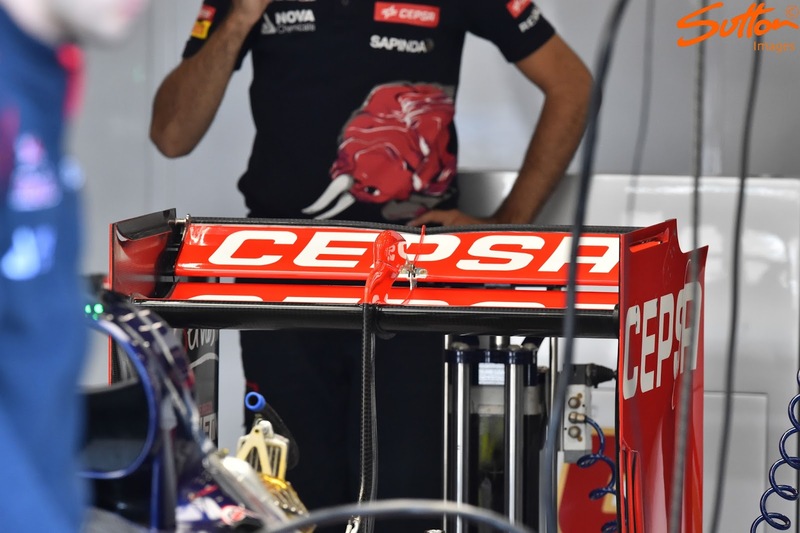 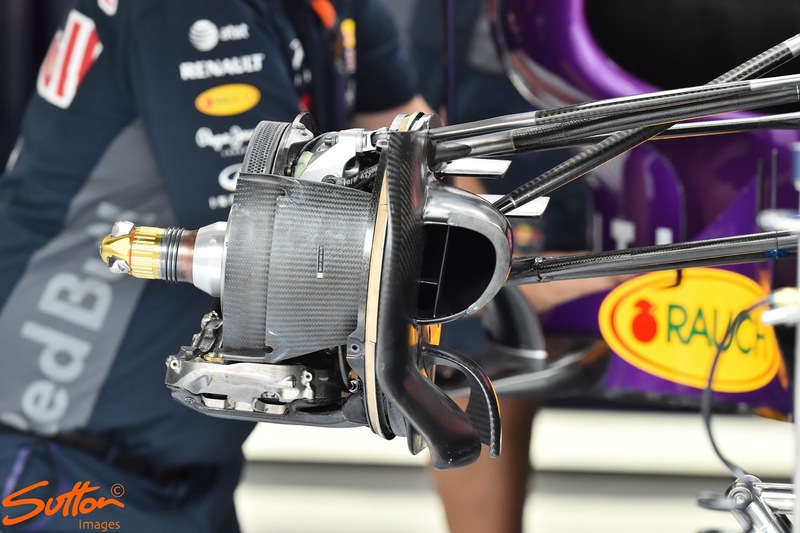 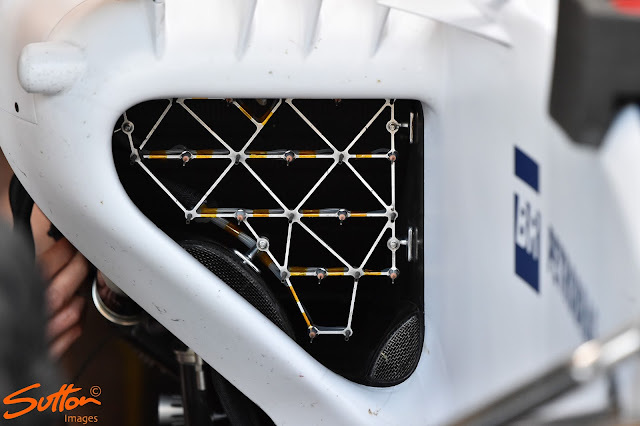 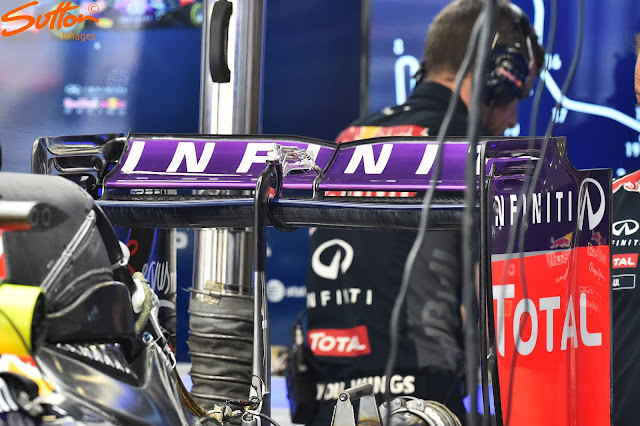 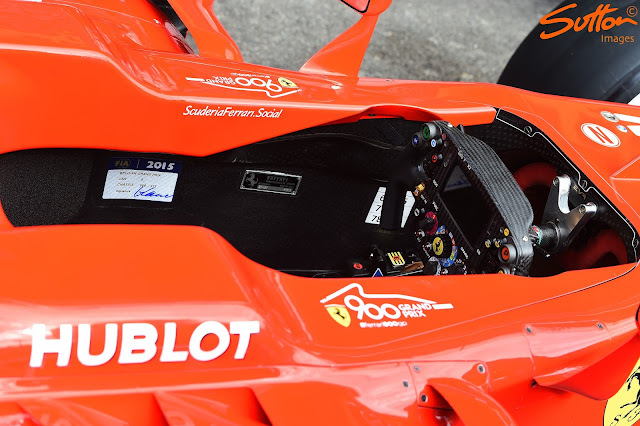 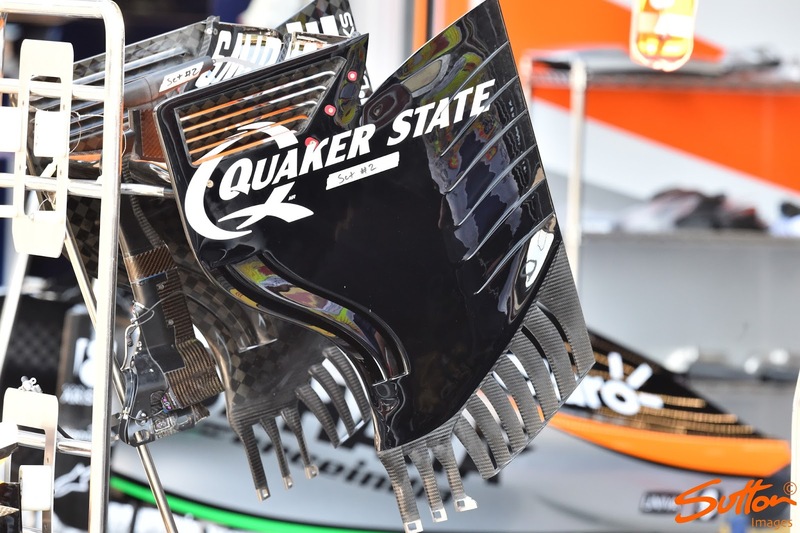 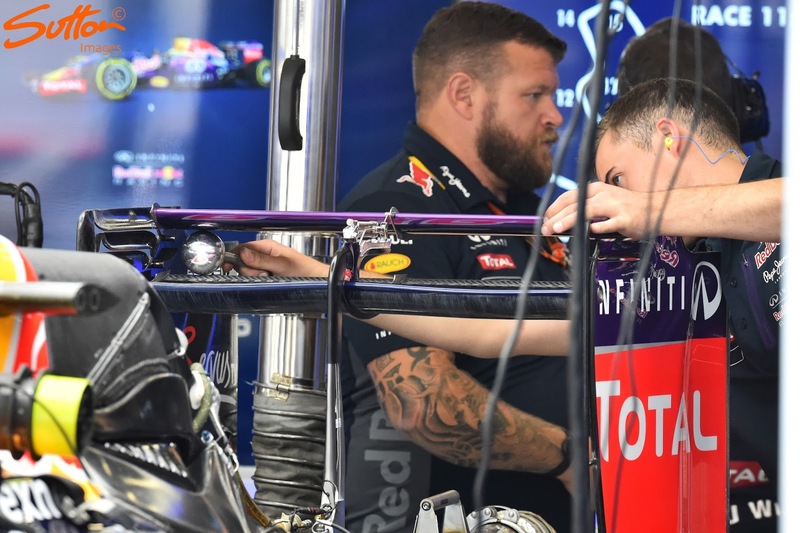 The new (for Belgium) rear wing has a completely different set of demands on it, especially as it related to the center of the structure, therefore the air flow around the engine cover is conceivably a bigger deal. OTOH, if I remember correctly Merc has been doing this, on and off, for years .. Newey as well. 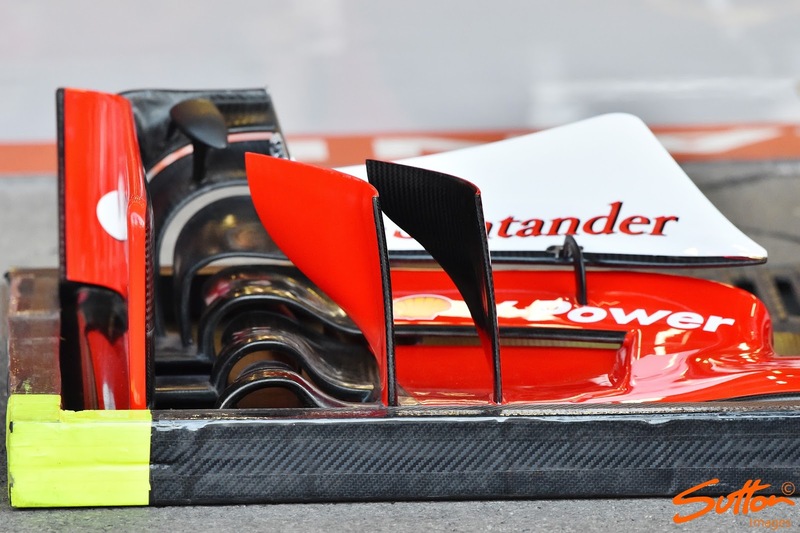 A bit off topic but a solid driver's screen can actually create some downforce, especially the higher it gets .. but then there is that drag thing again. 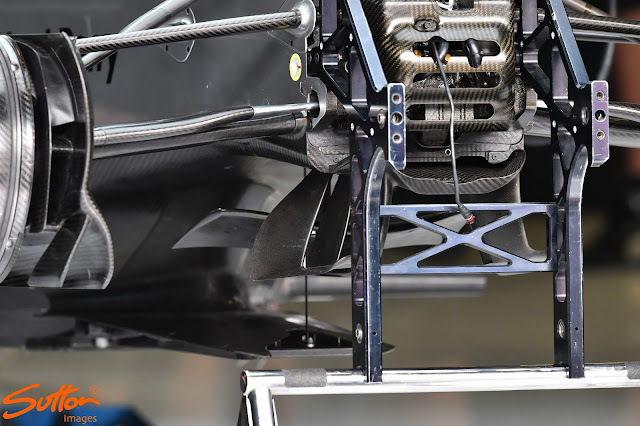 Today's aero tweaks are pretty interesting, as opposed to 10 years ago precisely because you cannot effectively "hack" for a lot of downforce and be successful anymore. 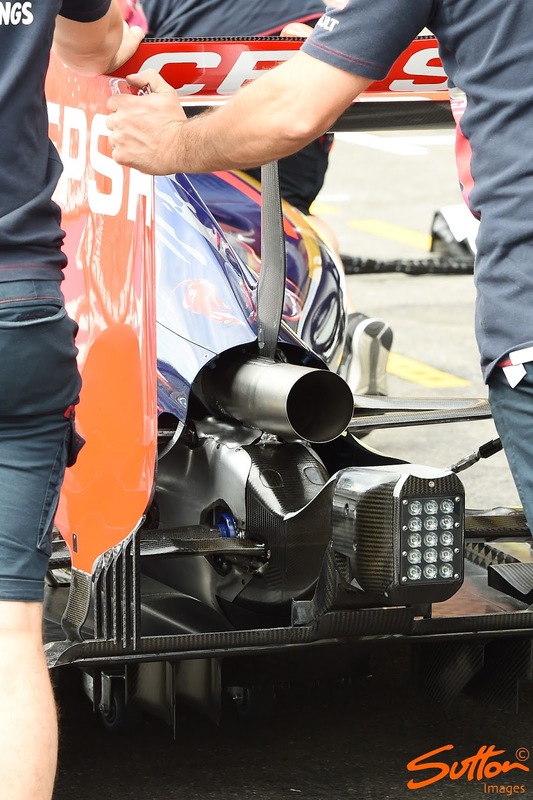 Drag is a very big deal these days ..